The LED submersible light is very suitable for Wedding Centerpieces, Party Decorate, Birthday or any other Celebrations at night. It creates a warm ambiance without flame ,wax smoke or mess to clean . Energy-saving and zero carbon emission. Can be reuseable just change batteries. 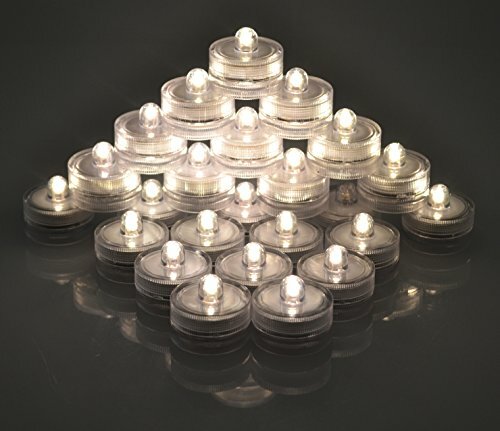 Package Include:36 x LED submersible light (Warm White). *May be there's an chromatic abberation between different computer displays, it's not quality issue and you can get a refund FREE in a month if you feel dissatisfied about anything. *Please remove the plastic insulation tape prior to use. Very suitable for Wedding Centerpieces, Party Decorate, Birthday or any other Celebrations at night. Creates a warm ambiance without flame ,wax smoke or mess to clean. Waterproof. you can put it in a Pool of water, fishtanks, anywhere you want to light up. Provide up to about 40 hours of continuous lighting. Can be reuseable just change batteries. Note: Since because it comes with a fully charged battery,the color of the light may be bright and something like white. Twist the light for easy on/off. Replaceable Batteries 2 per light-#CR2032. If you have any questions about this product by Samyo, contact us by completing and submitting the form below. If you are looking for a specif part number, please include it with your message.